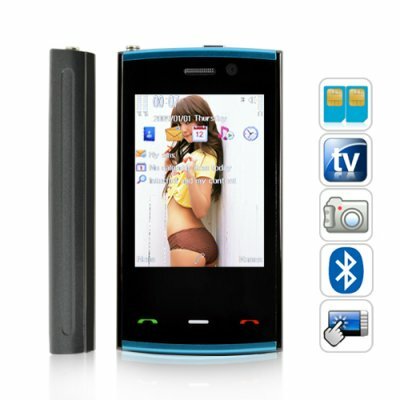 Successfully Added Avalon - Mini China Cell Phone (Quadband, Dual SIM) to your Shopping Cart. In the tradition of our best selling Elegance M31 phone, we are proud to bring you The Avalon Mini China Cellphone, an unlocked quad band GSM + dual SIM touchscreen cellphone with full featured PDA and multimedia functionality. The Avalon has what other popular mini cellphones like the HTC HD Mini and Nokia N97 Mini don't have - dual SIM / dual Standby and it sells for under 60 dollars! That's right this incredible Chinese mobile phone sells for under 60 USD and comes with a host of powerful features like: support for the four global standard GSM frequencies (850MHz, 900MHz, 1800MHz, 1900MHz) so you can trust it to work anywhere in the world. The Avalon also comes with a built-in dual front and rear digital camera and camcorder, a top of line MP3 / MP4 player, and even has the iPhone-like accelerometer mechanism so with the flick of your wrist you can change things like your desktop wallpaper or skip to the next song! Ideally suited for resale, The Avalon turns heads with its subtle elegance and sleek compactness. Sell it to your online customers for $80 to lock in an easy 33% profit! Brought to you by the leader in direct from China wholesale electronics - Chinavasion! Does the M123 come with an analog TV tuner? Yes, watch TV and be happy with The Avalon Mini China Cell Phone. No, this is better than all of them. Unlike with other Chinese touchscreen phones, the M123 comes with a full 12-month warranty from Chinavasion along with a professional in-house customer support service. You can also be secure in the knowledge that your M123 has gone through rigorous QC testing before it is shipped direct to you. What is Dual Standby and does The Avalon phone have it? A phone which is designed to work with 2 Subscriber Identity Modules (SIMs) are called Dual SIM phones. Of these Dual SIM phones, the ones which allow both SIMs to be active at the same time so you can receive calls on both are called Dual Standby phones. Yes, the CVTC-M123 is a dual SIM, dual standby phone. What kind of operating system does this phone use? I heard some products only support Bluetooth on SIM 1, can you please confirm that the Avalon does support Bluetooth on both SIM's? We have tested with multiple Bluetooth headsets and they all worked flawlessly on both SIM 1 and SIM 2. The shipping was very quick to Spain. The product meets the expectations Survive is a great phone for the money they want. I recommend it. on 2010-07-31 09:12:00 Great value for money. The phone arrived in Utah very quickly and performs as advertised. A few things to be aware of. The charging plug on the phone is via USB, but the phone connector is not a standard mini or micro-USB plug, but is proprietary (don't lose the included charging cable). The headphone connection is through the same proprietary connection so the only option is the included hands-free headphone/microphone set. Overall, great value for money. on 2010-06-17 01:40:13 Very Good !